Image caption Witnesses heard armed police shout "put your hands up"
Armed police are locked in a stand-off with a gunman after a shootout in Oxford. Thames Valley Police said shots had been fired from a property in Paradise Square and officers returned fire. Officers are currently negotiating with a man. One person is being treated for a non-life threatening injury, South Central Ambulance Service said. A cordon remains in place around Paradise Square and Norfolk Street. 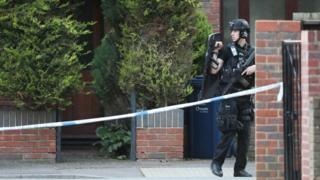 Firearms officers were called at 13:15 BST after witnesses reported hearing gunfire. On Sunday night police tweeted that officers "remain in Paradise Square working to resolve the incident". The force added that some residents were being allowed to return to their homes. John Rippington was in the pub waiting for a friend when he heard the commotion. "We heard one very loud bang and just previous to that, two guys had come in saying they thought they had heard gunshots outside." Another resident said he witnessed the start of the altercation between an armed man and the police, during which he heard about 20 shots exchanged. "He was shooting from the balcony and then he climbed down the balcony, he was in the gardens and police were kicking the back doors to other gardens trying to get him," the man added. "I could hear a female negotiator and an armed response man trying to get him to put his hands up, let go of the gun, keep his hands on show and things like that." Dean Dwyer, who saw armed police in the street, said: "They were screaming 'put your hands up'." A woman, who asked not to be named, told the Press Association she heard loud bangs from her balcony. "After a second round it became apparent these were gunshots so I rushed inside. "There was a couple more shots, three spurts in total, still a lot of shouting and barking. I heard a man shout 'show me your hands' repeatedly. "The shouting continued and only quieted down an hour later or so, between now and then there have been bursts of shouting, barks and helicopters." Tourist Janet Borgerson was in the nearby Malmaison hotel when she heard "explosive cracks" before a series of "loud bangs". "I thought the second round were firecrackers. I noticed hotel bar staff ushering people inside," she said. Ms Borgerson, who is visiting from the United States, said guests were later told they were "perfectly safe" and allowed to leave the hotel. "The police were quickly on site and after 45 minutes or so inside, they seemed to have the shooter isolated. "To the police, after a short time, this was definitely a 'keep calm and carry on' moment." Image caption Witnesses said emergency services "stormed down the road"
BBC reporter Will Banks said a helicopter was hovering over the scene, with at least 10 police vehicles on the ground and police activity centred on Paradise Square. Andrew Mace, from Middle Barton in Oxfordshire, praised the emergency services for their conduct. The 16-year-old said: "We walked towards Paradise Square for a wander and there were about 20 police cars and five ambulances storming down the road. Police then stopped us from walking down and taped up the road. "We walked up the hill then 10 paramedics carried a stretcher down past us to the scene. The police did a good job not to cause a commotion and secure the area." Fred Dimbleby, editor of Cherwell Online, tweeted footage showing paramedics carrying a stretcher to the scene. Members of the public have been warned to avoid the area and the Oxford Tube, and Stagecoach said buses are not stopping on Castle Street. Supt Joe Kidman said: "People in Oxford will notice an increased police presence in the area while officers are dealing with the incident, which is contained and taking place at a residential property."